Any trip to Put-in-Bay would not be complete without a stop at our favorite watering hole, Mr. Ed's Bar & Grille. Located right smack dab in the middle of downtown Put-in-Bay, it is hard to miss. There's a big horse sign out front and usually some great tunes jamming out from their awesome sound system. Midwest bands are features all throught he summer, usually on weekends but occasionally during the week as well, and after the sun sets this place gets packed with bachelorette parties, boaters, and a great lively young crowd. However, we stopped here for lunch on our visit so it was a little tamer, but still loads of fun. If you ride the Jet Express, there is a coupon for a free kid's meal, but we didn't bring any young 'uns with us this time. Our group was hungry so we came for the food. We were not disappointed. Everyone's meal came out fresh and hot and on time. Note: very friendly and cute waitresses! 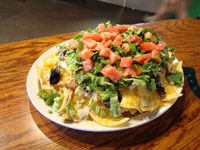 Our long-time author and avowed food critic decided to pursue his Mexican urge by ordering the Killer Chicken Nachos. Wow! The portion size here is not for the faint of heart. The plate may look small in the picture, but it was a mound of food. There was a layer of fresh-fried crispy nacho chips still hot from the deep-frier, covered with handfuls of shredded cheese that had melted nicely. Topping this was a generous amount of shredded chicken that has been seasoned quite nicely but not too much. Climbing the nacho mountain further, we found black olives, onions, and sour cream. Crowning the green lettuce summit was a nice batch of fresh diced tomatoes. Not pictured were the extra sides of homemeade salsa and more sour cream. All of this nacho goodness for a measly $8.99. And if you want a little extra flavor, add on a side of jalapenos or guacamole for $1.99 each. The fact that our reviewer barely uttered a word as he dug in to this small fortress of Mexican delight speaks volumes as to how good these nachos are. 20/20 hindsight, I would have probably gotten the pickled japapenos as a side just to give that little extra flavor profile that some nachos often lack. It would have been a good counter-balance to the loads of cheese and sour cream. Next up, we tried the reuben sandwich which was a steal for only $7.99. This was recommended by the waitress as one of their most popular items, alongside their turkey reuben. 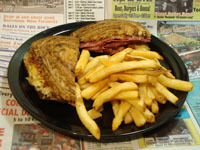 The regular corned beef was chosen and fries substituted for chips. It came out piping hot and the innards were starting to just ooze out the edges. You could smell the warm mix of coleslaw (not kraut) and swiss with a tangy hint of thousand island dressing. The sandwich was served on marble rye bread that had a great fresh flavor too it that was partially hidden by the generous amount of buttery spread that the sandwich was grilled on, making it slightly squishy and toasty all at the same time. The fries were crisp and hot with the skins still on, as is usual here. The sandwich was filling, especially with the fries, and left our buddy with that warm full happily greasy feeling after you have eaten a good grilled sandwich. not too heavy, not too light... just right. Leaning towards a healthy and island theme, Big Mike (name changed to protect the not-so-innocent) decided upon the perch basket ($12.99) and a side salad ($4.99). The salad came out with the perch, as requested, and was defintiely what was advertised... a salad. None of us are very rabbity so there's not much to say other than it looked and tasted fresh. Ed's does offer other, larger, meal-sized salads that we saw others eating and they looked pretty darn good actually (although, I doubt they could stack up to the great Taco Salad that Ed's has at their mainland Port Clinton location!). 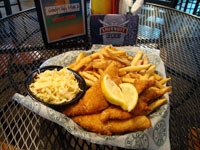 The lake Erie perch basket was piping hot, fresh from the vat of oil in the back. Anyone who knows this reviewer knows that I don't like little fish, too fishy for me, but Big Mike says these fish "are the bomb". Straight from the horse's mouth, so to speak... "The fish were battered in a light crispy crust that went well with their flaky interior. You get two sides and I wanted fries and slaw. Both were good. Fries hot. Slaw cold. Not enough tarter sauce, but I just asked and she brought more." A ringing endorsement if there ever was one! In the end, we all got what we needed and went away full and happy and with a healthy little buzz (did I forget to mention this is a BAR?!?! LOL!). We have been coming here for years and rarely if ever have a bad experience. 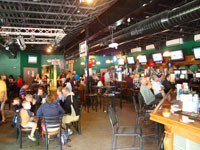 The food's always awesome and the drinks are always flowing. Mr. Ed's gets two hoofs up!